Zimbabwe President Robert Mugabe and his wife, Grace, pose for a photo at State House in Harare, Oct. 28, 2014. Zimbabwe President Robert Mugabe’s decision to replace his ousted vice president with two people restores the African country’s leadership structure introduced a quarter-century ago to quell conflict between two political parties. Former Justice Minister Emmerson Mnangagwa and former Ambassador to South Africa Phelekezela Mphoko, both members of the ruling party Zimbabwe Africa National Union-Patriotic Front, are scheduled to be sworn in Friday in the capital, Harare. They’ll share the title held solo for almost two years by Joice Mujuru, once considered the likely successor to the 90-year-old Mugabe. FILE - Joice Mujuru's political future is uncertain after her ouster this week as Zimbabwe's vice president. The president fired her Tuesday. Among the charges pending against Mujuru is that she plotted to assassinate Mugabe. She rejects the accusations. Mnangagwa replaces Mujuru, while Mphoko succeeds the late Vice President John Nkomo, who died at age 79 in January 2013. Alex Magaisa, a lecturer at Kent University in London, says returning to a system of two vice presidents conforms with a 1987 unity agreement between former political rivals ZANU-PF and PF-ZAPU. "There is a historical dimension to this whole issue of the number of vice presidents in Zimbabwe," Magaisa said. "Zimbabwe went through a terrible time in the 1980s, when there was almost a civil war between the two main political parties." The agreement joined the ZANU-PF and the Zimbabwe African People’s Union (PF-ZAPU) under Mugabe's leadership. Mujuru's sacking surprised most Zimbabwe residents, Magaisa said. "If you asked any Zimbabwean in the middle of the year who would become President Mugabe’s successor, I think most people [would] say Joice Mujuru," he said. "She was almost there. But, unfortunately, there has been a palace coup essentially. Mr. Emmerson Mnangagwa has managed to get in in front of her and he is now the heir apparent to President Mugabe. “The reason why she has been pushed out was because she has become a significant threat to President Mugabe. She controlled the bulk of the party," Magaisa said. 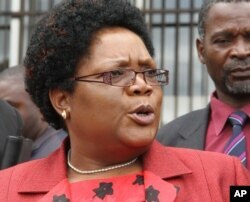 Though Mujuru enjoys support at the grassroots level, she has limited choices within the ruling party, Magaisa said. "There are two choices: Either she opts out to challenge President Mugabe or his replacement in the 2018 elections. … But she would also have to consider the cost and benefits of moving out of ZANU-PF. "In any case, ZANU-PF has a file on each and every member of the political party, and all the crimes and shenanigans that you may have committed during your tenure would be brought up as soon as you decide to challenge the power structure," Magaisa said. Mujuru "might decide to for self-preservation to remain in ZANU-PF, lie low for some time hoping that she would get a chance." Magaisa said Mujuru has gained sympathy from Zimbabweans after coming under verbal attacks from both President Mugabe and first lady Grace Mugabe before her dismissal from office.